Check in at 1385 O`Higgins Street (Arturo Prat Port) in Punta Arenas between 13:00 and 17:00 (1-5 PM) on the day of your Australis cruise departure. Board the vessel at 6 PM. After a welcoming toast and introduction of captain and crew, the ship departs for one of the remotest corners of planet Earth. During the night we cross the Strait of Magellan and enter the labyrinth of channels that define the southern extreme of Patagonian. The twinkling lights of Punta Arenas gradually fade into the distance as we enter the Whiteside Canal between Darwin Island and Isla Grande de Tierra del Fuego. 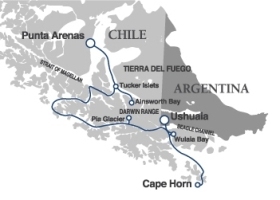 4 Night Cruise sailing from Punta Arenas to Ushuaia aboard Stella Australis. Check in at 1385 O’Higgins Street (Arturo Prat Port) in Punta Arenas between 13:00 and 17:00 (1-5 PM) on the day of your Australis cruise departure. Board the vessel at 6 PM. After a welcoming toast and introduction of captain and crew, the ship departs for one of the remotest corners of planet Earth. During the night we cross the Strait of Magellan and enter the labyrinth of channels that define the southern extreme of Patagonian. The twinkling lights of Punta Arenas gradually fade into the distance as we enter the Whiteside Canal between Darwin Island and Isla Grande de Tierra del Fuego. *Conditions Apply: All prices shown here are per person share twin (unless stated as single) in USD, based on best available cruise fare at time of publication (02Jan19). All prices based on cash payment - credit card fees may apply. Visitors to Argentina must complete an online visa application prior to arrival which is not included and is the guests responsibility. Cruise deposit, amendment and cancellation conditions apply. Travel agent service fees may apply. Deposit of USD $300 per person is required to guarrantee a booking. All passports, vaccinations and visas are the responsibility of the travelling guest to secure prior to departure from Australia. Please note that the prices shown here are not shown in real time. Airfare/taxes and transfers are not included. While we endeavour to keep our pricing as up-to-date as possible, the advertised prices shown here may differ from the prices in our booking system at time of reservation. Offer subject to availability at time of booking.